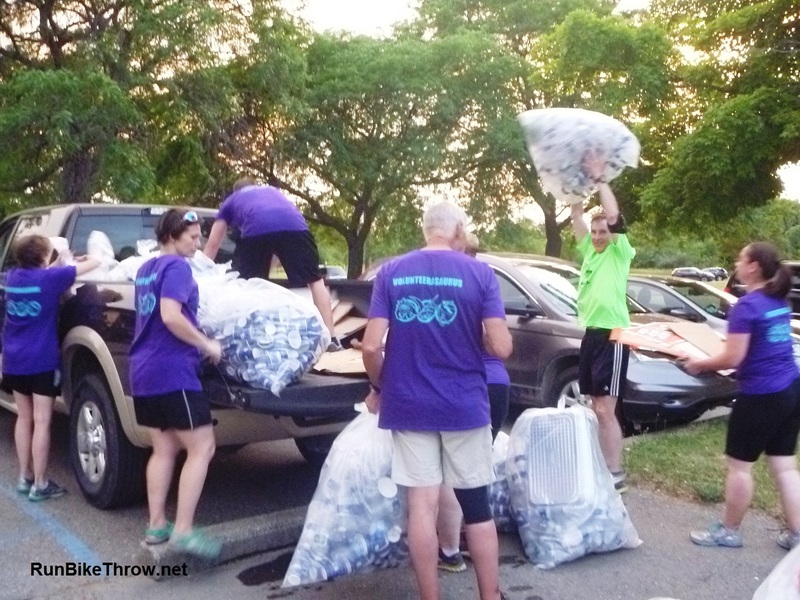 THANKS TO MOTHER NATURE AND A FELLOW RUNNER for two memorable experiences Saturday night at the Northville Road Runner Classic 8K road/trail race. Normally I don’t race much in midsummer. But I like me a good 8K trail run, for the challenge of the off-road terrain and a distance short enough to run hard. So I took a break from my LSD and slept in on Saturday morning. My body ordered me not to feel guilty about it. Rain was likely so I packed a backup set of clothes, including socks and shoes. I even brought a warmup jacket, as the temperature had also dropped from the mid-90s of the past few weeks into the 60s. I was looking forward to finishing a run without being soaked in sweat. At the park I put on my race bib and set out on my usual one-mile warmup run. It started to rain. People headed for cover. I kept running; a little water doesn’t bother me. Then the Good Lord turned the shower full on. My jacket soaked through. The flooded paths soaked my socks and shoes. 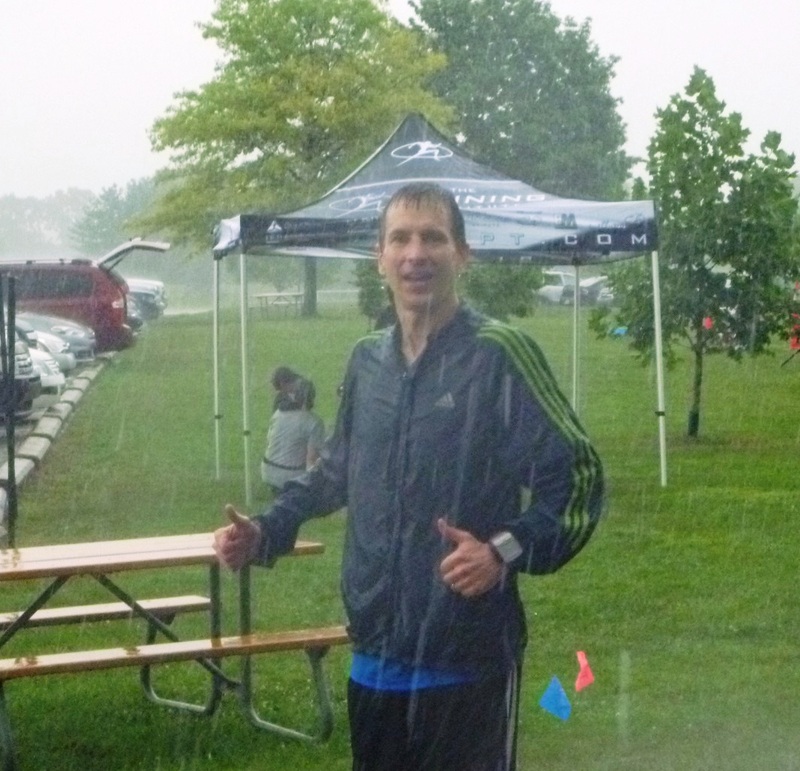 I completed my warmup – after all, I couldn’t get any wetter. As I headed back to the pavilion, still in the downpour, I invited the people huddled under the shelters to come out. “What are you doing under there?” I shouted. “This is running! Embrace the rain!” (Yes, I actually did say that.) No one joined me, but someone was nice enough to step into the rain for a moment and capture this photo. So I was soaked after all, and the race hadn’t even started yet. I returned to my car to change – and discovered that I hadn’t packed a second short-sleeve shirt. So I resorted to an act of anathema, and put on the race shirt before I’d actually run the race. (*) I didn’t get struck by lightning or break a leg tripping on a tree root, so I guess the running gods forgave me. The rain ended shortly afterward, and we lined up for the race. I got off to a quick start and established a position in one of the front-running packs. From there I held my own until near the end, when one guy who had been just behind me caught up and passed. I felt pretty gassed, so I let him go. But as we emerged from the woods and the finish line came into view, I heard someone behind me shouting, “Go! Catch up with him!” I glanced quickly behind me and saw a guy in a white shirt charging at me hard. This was too much. Not gonna happen. I went into an all-out sprint – and something amazing happened. In other races, my final sprints have been painful, gasping efforts. This time it was smooth, even effortless, a “finishing kick” I’ve never felt before, and it carried me over the finish line just ahead of him. Incredibly satisfying. Something to remember and carry forward to my future races. 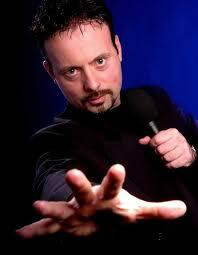 Now here’s a guy I don’t want chasing me. Fellow PR Fitness runners Aaron (left) and Erin (center) were also there, and our small contingent acquitted itself very well. Aaron finished first in the 55-59 age group, and Erin won the female Masters – that is, she was the top woman finisher age 40 and over. 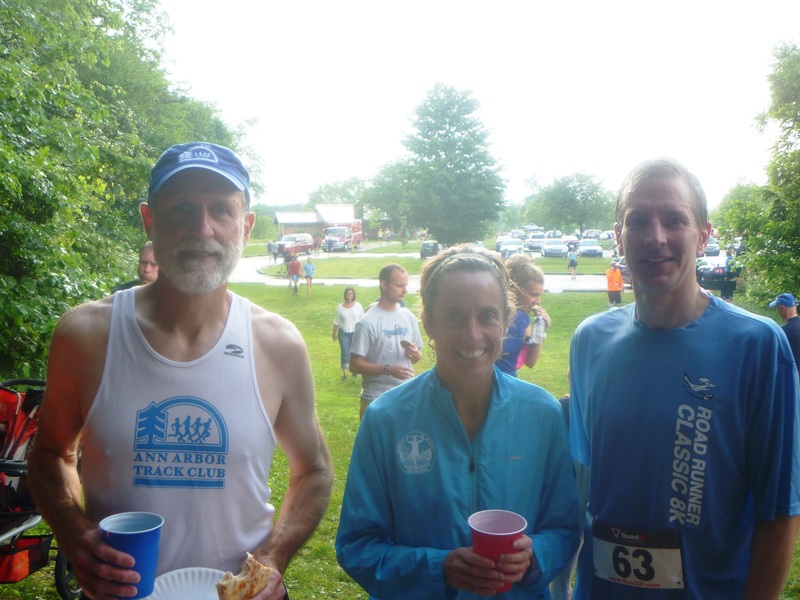 I had a good race too, finishing second in my age group (50-54) and the third overall male Masters finisher. The race shirt is pretty nice. The back has a variation of the old proverb that usually involves a lion and an antelope. 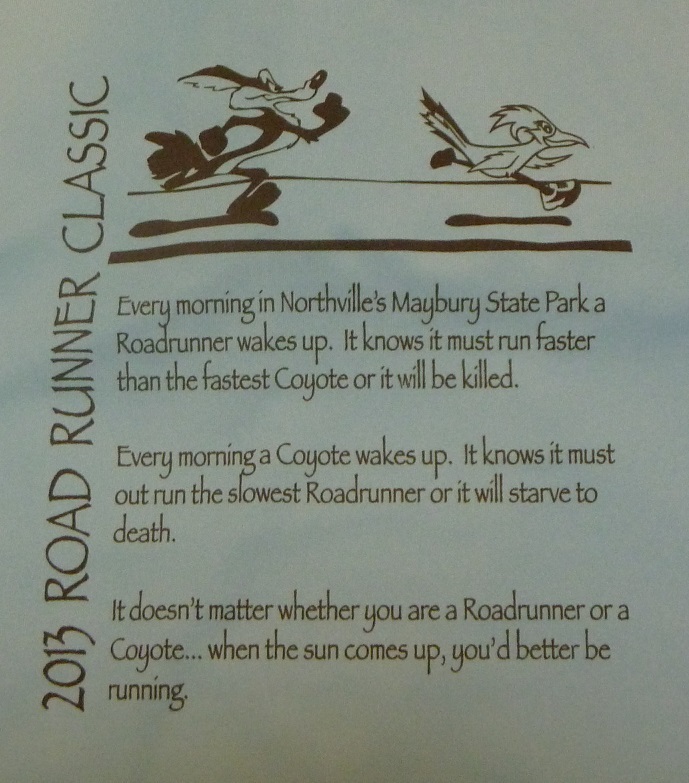 But of course the road runner has a famous nemesis too. (*) There’s nothing wrong with wearing the race shirt before the race, but it’s a negative superstition among experienced runners. Kind of like saying “Good luck” to an actor before a performance instead of, “Break a leg.” The idea is that you shouldn’t wear the shirt until you’ve “earned it” by crossing the finish line. Many people wore it anyway, and one of the race volunteers said, “Nice shirt,” as I passed his station. So there you go. 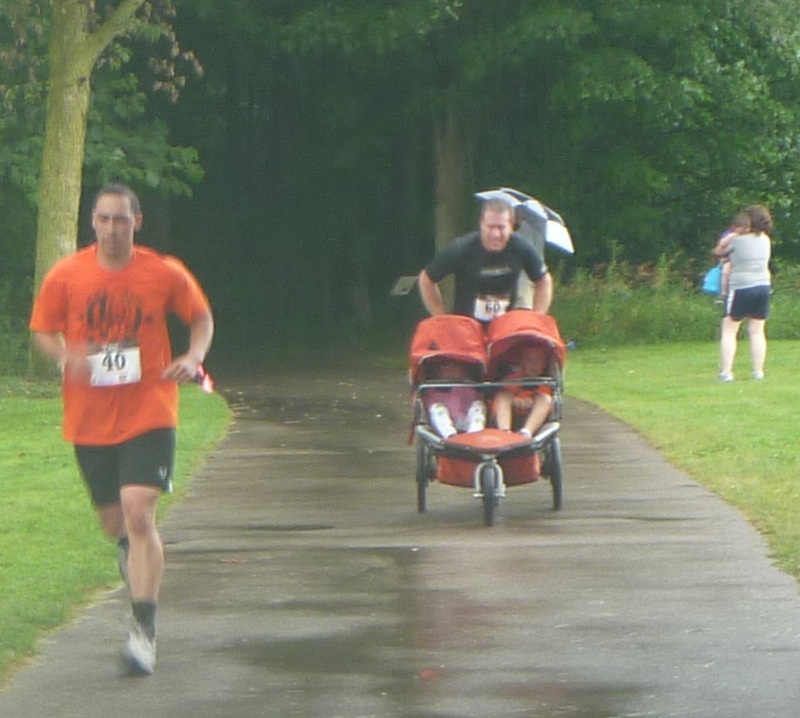 This entry was posted in Running & Cycling and tagged 8K, Northville, PR Fitness, race, rain, roadrunners, Running, trail run. Bookmark the permalink.